Following an unusual fatal accident on a Southwest Airlines 737 jet in which an engine inlet cowling was torn off by an engine explosion, the Federal Aviation Administration (FAA) has begun a safety review focused on potential structural failures of the cowling. That’s a part of the engine, the ring-like front cover forward of the fan, that up until now had not been considered a vulnerable structure. Current engine certification procedures don’t include stress testing of the cowling. There were at least two previous non-fatal incidents on passenger flights, one in 2016 and one in February, in which broken fan blades within the engine likewise caused disintegration of the cowling. In modern jet engines, the area around the fan is beefed up with Kevlar or extra layers of thicker metal — a so-called containment ring — that is designed to hold in any fan blades that break off. As a result, broken pieces of fan blades are typically sucked into the engine and expelled out the back. It’s imperative that no metal shrapnel should dangerously exit sideways, toward the passenger cabin or into the fuel-filled wings. However, when a fan blade broke off in these three incidents, it appears that a piece shot forward and hit a part of the cowling outside the containment ring. In all three cases, the entire front of the cowling was sheared off. “That area is not built to take the kind of stresses that the containment area is,” Lunsford said. The accident that triggered the safety review, on Southwest Flight 1380 in April, caused the death of a woman passenger. Last month, the National Transportation Safety Board (NTSB), identified metal fatigue as the cause of the broken fan blade that destroyed the cowling. And after piecing together the engine debris, investigators said part of the cowling struck and broke the window by the woman’s seat, causing the passenger cabin to depressurize. She was partially sucked out of the plane. The two previous incidents look comparable, but with much luckier outcomes. In August 2016, a similar uncontained engine failure on another Southwest 737 caused Flight 3472 from New Orleans to Orlando to divert to Pensacola, Florida, where it landed safely with 104 people on board. The NTSB investigation into that incident found that a fan blade had broken off and that as a result the left engine inlet cowling separated from the engine during the flight. Debris from the cowling damaged the airplane fuselage, wing and tail, and left a 5-inch by 16-inch hole in the fuselage just above the left wing, the NTSB report said. The engine involved in both Southwest incidents, a CFM56, had until then an impressive safety record. Manufactured by CFM International, a joint venture between GE and Safran of France, it’s been in service since 1997 and has flown for 350 million flight hours, according to CFM spokeswoman Jamie Jewell. 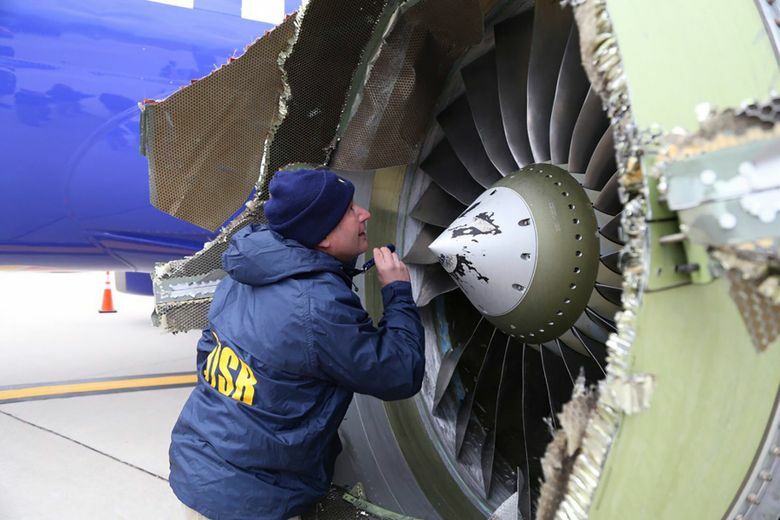 After the accident, the FAA issued directives mandating ultrasonic fan blade inspections for all such CFM56 engines that have accumulated more than 20,000 flights and requiring airlines to continue to perform these inspections every 3,000 flights. In February this year, yet another inflight engine cowling loss occurred on a different jet with a different engine, this time a Boeing 777 powered by a Pratt & Whitney PW4077 engine. As it began its descent into Honolulu, United Flight 1175 from San Francisco, with 378 people on board, experienced “an in-flight separation of a fan blade and subsequent loss of the inlet and fan cowls of the right engine,” the NTSB reported. The crew declared an emergency and proceeded to land safely. The FAA’s Lunsford said it is very difficult during engine certification to duplicate on a ground test stand all the conditions that affect an engine in flight, including the angle of climb, the air turbulence from the fuselage and wing, and the relative angle of the wind. “There are a lot of variables you can’t duplicate on a test stand,” he said. Lunsford said the FAA during its safety review, which will likely take months, will discuss with the engine and airplane manufacturers and with engineers how to quantify the problem and ultimately fix it. In a separate development, the office of the Inspector General (IG) of the Department of Transportation announced an audit Wednesday of the FAA’s oversight of safety at Southwest. The IG memo says the safety review is spurred by the similarity of the 2016 engine incident on Southwest Flight 3472 to the fatal accident just over 18 months later. After the 2016 accident, “it is unclear what actions the carrier took to manage the risk to prevent a future failure,” the IG memo states. “We are concerned whether FAA’s oversight includes an assessment of the carrier’s ability to identify hazards and analyze and mitigate risks,” the IG said.